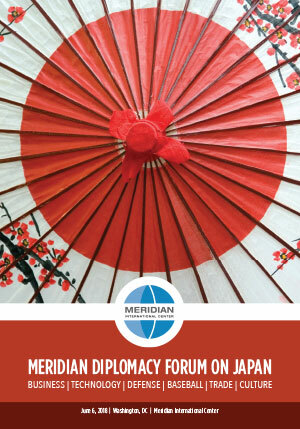 The annual Meridian Diplomacy Forum convenes government and business leaders with academic experts and cultural visionaries to examine the position of soft power alongside trade and security in international relations. This year the Diplomacy Forum explored U.S.-Japan relations, one of the most important bilateral relationships in the world. The foundation of the modern U.S.-Japan relationship that began in the late 20th century has been built on the open exchange of ideas, culture, and technology that have led to significant economic gains and opportunities. Many of the hallmarks of American culture today – from entertainment and sports to technology and infrastructure – are results of that bilateral exchange and influenced by Japanese trends. At the same time, each country retains distinctly unique cultural identities and political structures. Through featured speakers and panel discussions, the Diplomacy Forum examined various aspects of U.S.-Japan ties: the state of this bilateral relationship; our security and defense partnership; leadership in the areas of robotics and artificial intelligence; Japanese business culture; and, the power of baseball diplomacy.